The last biopsy came in as a benign lymph node. Thank god!! The doctor felt pretty certain it was a lymph node but went ahead and biopsied it anyway. By far, that has been the most uncomfortable- I'm terribly black and blue for a large portion of my breast but that's ok, it's going away a little every day. c) much less than 6 weeks of radiation, in that order. I will plead, beg, and offer baked goods in order to get him to see things my way, though I suspect I may not be so lucky. 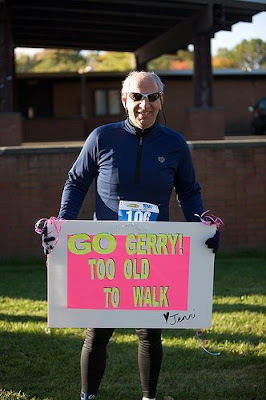 I made this sign for my (old) friend Gerry who was competing in a duathalon. I was teaching in the city so I made it ahead of time and had it snuck onto the course. He did well, winning his age group (which was just listed as "old"). Though I have my suspicions he may have been the only guy in that age group because everyone else is most likely dead. What a handsome and great guy. And a good dancer, too. Congrats on another great accomplishment. And on not needing the paramedics. I am so elated that you got such great news.